The Transatlantic Economy Report 2018 presents the most up-to-date facts and figures about the EU-US economic relationship. The research was conducted independently by Dan Hamilton and Joseph Quinlan of the Center for Transatlantic Relations, Johns Hopkins University. The study includes dedicated profiles for 30+ European countries and all US states. Despite transatlantic political turbulence, the U.S. and Europe remain each other’s most important markets. Eurozone growth of 2.5% in 2017 exceeded U.S. growth of 2.3%, and both economies are set to maintain robust growth in 2018. Transatlantic trade gaps have narrowed. The transatlantic economy generates $5.5 trillion in total commercial sales a year and employs up to 15 million workers in mutually “onshored” jobs on both sides of the Atlantic. It is the largest and wealthiest market in the world, accounting for one-third of world GDP in terms of purchasing power and half of total global personal consumption. America’s combined asset base in Poland, the Czech Republic and Hungary (roughly $164 billion) was larger than its asset base in India ($131 billion). In 2015 the UK, France and Germany accounted for 48% of U.S. affiliate manufacturing employment in Europe. In 1990 they accounted for 67%. Meanwhile, the combined share of U.S. affiliate manufacturing employment in Poland, the Czech Republic and Hungary jumped from virtually zero in 1990 to nearly 12% in 2015, indicative of the eastern spread of U.S. European operations. 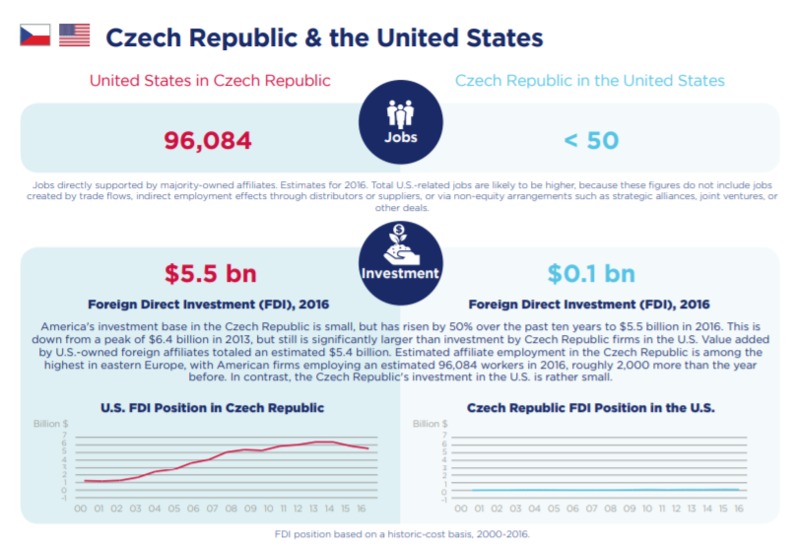 America's investment base in the Czech Republic is small, but has risen by 50% over the past ten years to $5.5 billion in 2016. 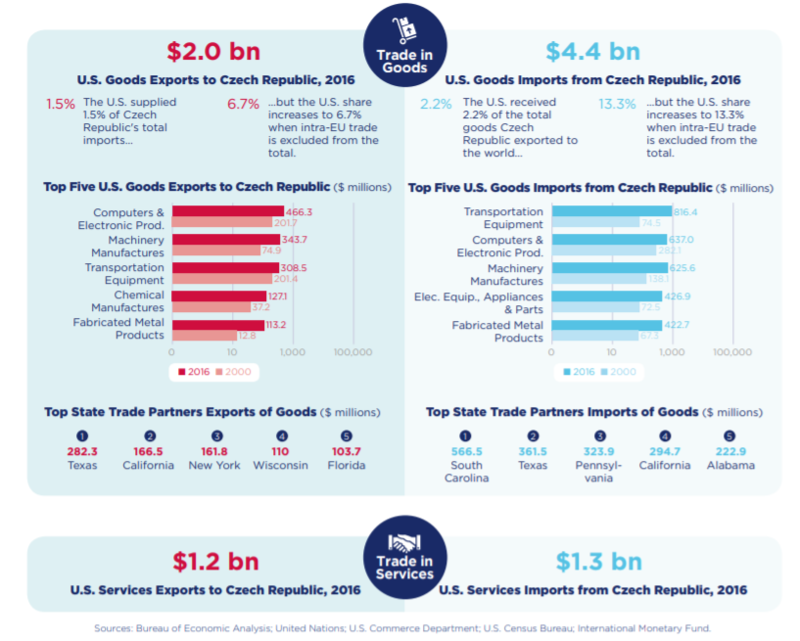 This is down from a peak of $6.4 billion in 2013, but still is significantly larger than investment by Czech Republic firms in the U.S. Value added by U.S.-owned foreign affiliates totaled an estimated $5.4 billion. 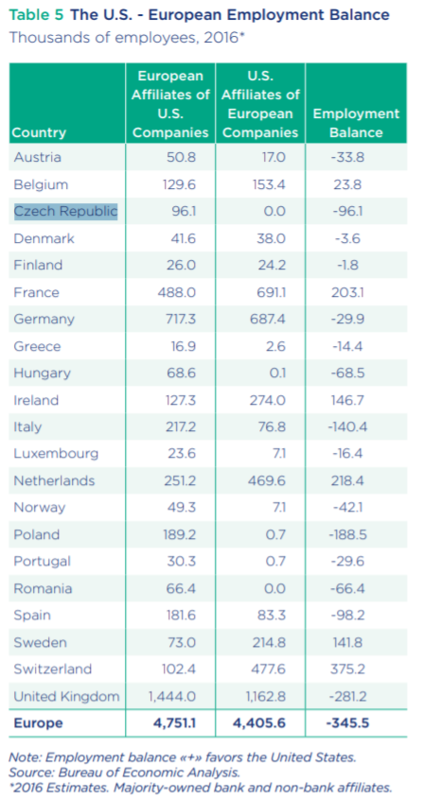 Estimated affiliate employment in the Czech Republic is among the highest in eastern Europe, with American firms employing an estimated 96,084 workers in 2016, roughly 2,000 more than the year before. 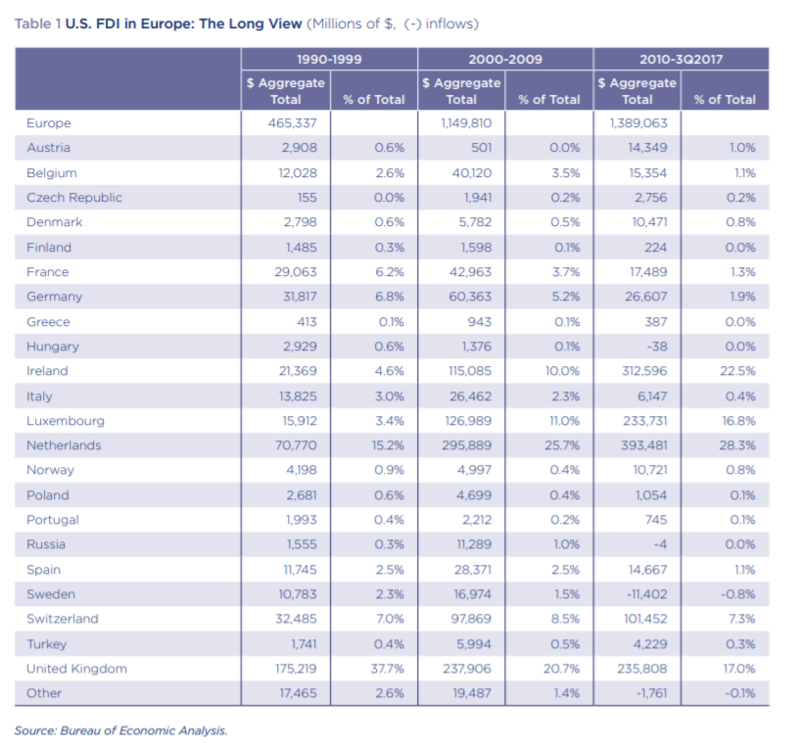 In contrast, the Czech Republic's investment in the U.S. is rather small.